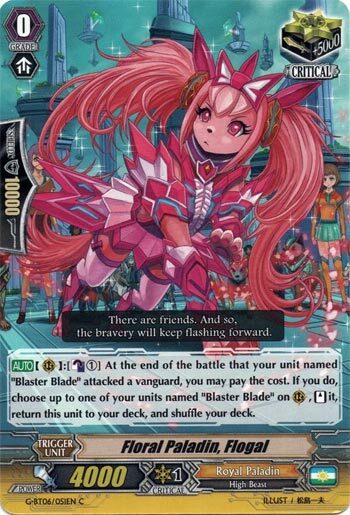 [AUTO](RC):[Counter Blast (1)] At the end of the battle that your unit named “Blaster Blade” attacked a vanguard, you may pay the cost. If you do, choose up to one of your units named “Blaster Blade” on (RC), [Stand] it, return this unit to your deck, and shuffle your deck. …it’s still good. Relative to Blasters. Who are sort of okay. What’s up, Rogue Squad?! For our Throwback this week, I figured that we look at what was one of the reasons that Blaster Blade made a great comeback before the Aichi Legend Deck was even a thought. Floral Flogal (calling it FF for short) has been deemed one of the best Critical triggers of all time to a lot of people along the lines of Paradigm Shift Dragon and Belial Owl, but what makes FF so great is that all it needs to activate is to see Blaster Blade attack the vanguard, and then it just goes back to the deck (ergo an extra Critical back to the deck) to give that Blaster Blade another go. The main drawback for this is that it does cost a Counterblast to activate and that Blaster Blade has to go after the Vanguard as rear-guard attacks won’t let FF work, but both of these cons can be forgiven as the Blaster deck is known to have a solid Countercharge engine and that there’s no need to go after the rear-guards as the deck has a few ways to just retire them flat out. Simply put, if you play Blaster Blade, then you play these Criticals alongside him. Next Time: Dark Irregulars get another Silent Tom…that’s easier to activate?! Go Rogue… Go Pro… and Fight the Meta!! !